I don't know about you but I love the winter for nights in, it's the perfect time to cosy up with a good movie or have a full on pamper night and treat yourself and your skin to some TLC. Lately I feel like I have been having them more and more so I want to share what normally happens on these winter nights in I have. My relaxing night always starts after my little bear goes to sleep around 7 and by that time I am dying to climb into a steamy hot bath and pamper the S%*& out of my skin. I turn that hot tap on, pick out a bath bomb and get all my goodies ready to use along with sticking my PJ's on the radiator to get them nice and toasty for when I eventually get out looking like a prune! I specifically love Lush bath bombs and the Thundersnow one is a favourite of mine right now. I am also loving all the soap and glory things I got at Christmas, their Scrub of your life is just amazing, I love how clean it leaves my skin feeling. When I have a pamper I enjoy using a clay mask for my body, I always feel super relaxed when I use it. 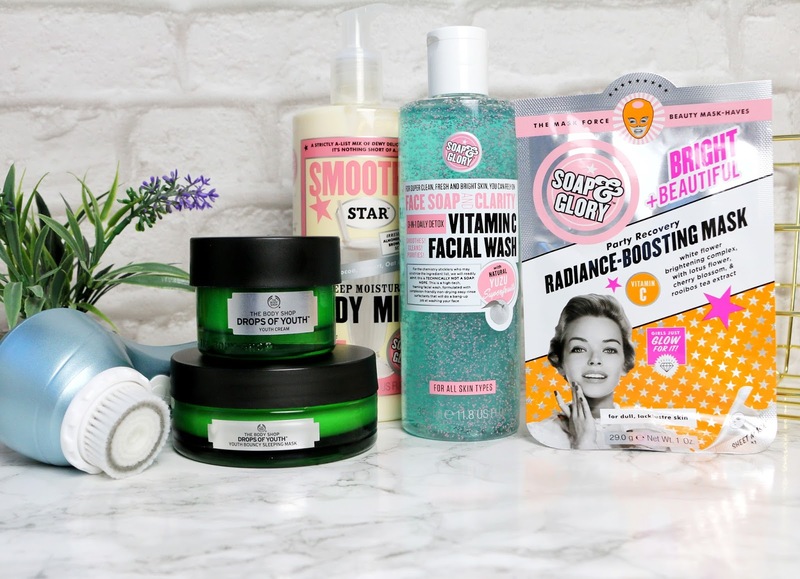 I also like to give my face a good pamper, this all starts when I'm in my bath where I will use my face wash, the Soap and glory Vitamin C one is just magical for my skin, I am so glad I got it for Christmas. I will use this with my Magnitone bare face along with the face scrub to really give my skin a good clean. Then once I am out of my bath I will use a face mask of some sort then use my body shop face creams to really make it soft. I love the whole pamper process I have with my face, I always feel amazing when it's done, skin feeling clean and soft. Just what I like. 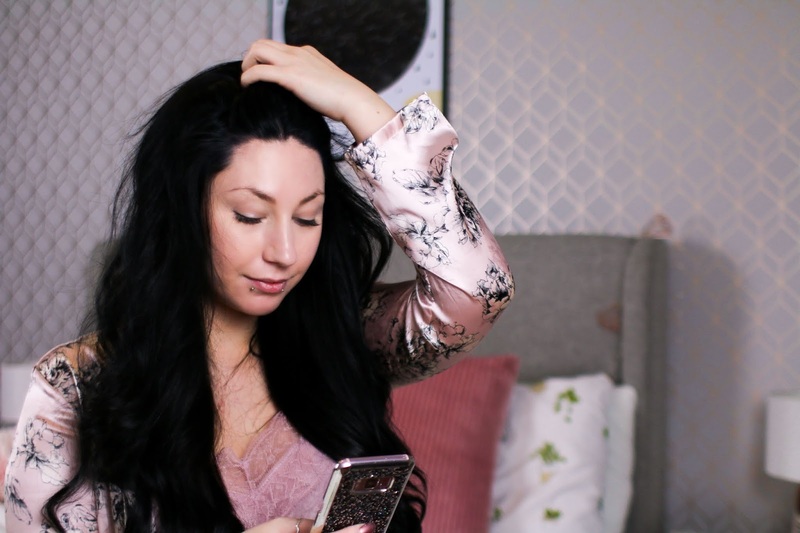 On pamper nights I love to give my hair some TLC because it obviously deserves it right? When I really want to treat my locks I'll bring out my OGX stuff and use a nourishing mask. 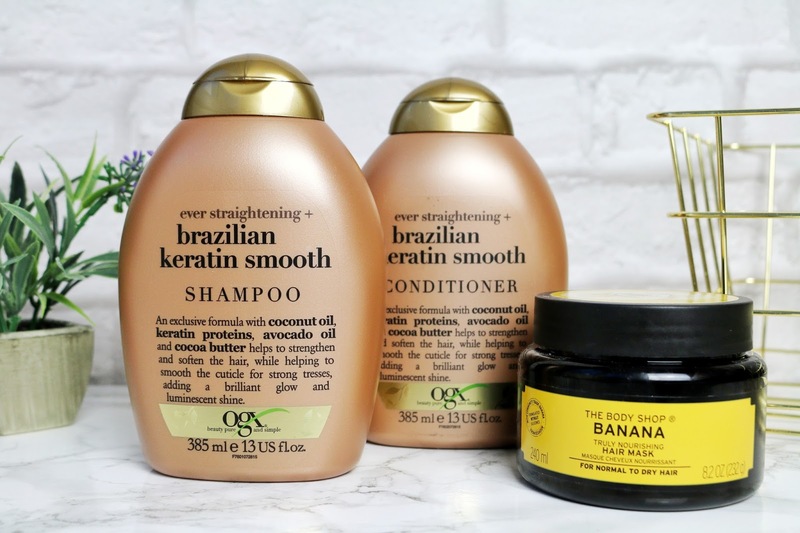 The banana one from The Body Shop is very good for the hair, I notice how much softer it is after use and my hair looks shiny and healthy and when you use the OGX stuff with it? well, my hair looks AMAZING! I just love using this combination to treat my hair and make it feel well looked after. Once I get out of my bath it's time to put on some comfy night wear, this night dress from Uk Lingerie is my go to at the moment. I love how it feels, the fabric feels soft against my skin and I always feel fancy when I wear it. 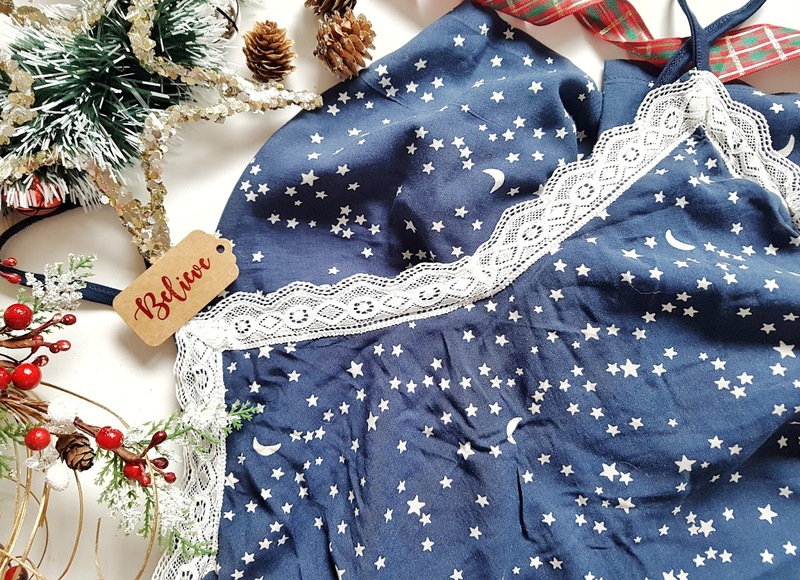 This night dress has hidden support as well which is a blessing for me since I kind of need it. I put this over my radiator to heat it up then slip it on when I'm out my bath. Once I am out of the bath, got my night wear on and got my body covered in lotion I like to give my feet a good pamper and to do that I like to use my Well Heeled by Magnitone. This leaves my feet feeling super soft and cared for then I like to use a good foot lotion to help keep them in fab condition. Now that I have all my skin care out of the way I like to paint my nails, both my hands and toes. These O.P.I ones are among the best that I have ever used. My personal favourite is the gold one, it looks fantastic on. It's nice to get a good pamper and make myself feel good, it's an important part of my self care routine and 2018 for me is all about self care and self love. To finalise my night I like to put on a good film and cosy up in my bed, it's nice to just relax for a while and unwind after a day of keeping a little human amused and happy when he really wants to have a melt down at everything haha. Plus with my new Leesa mattress it's even easier than ever to get comfy and get a good sleep. After the movie I start to read before bed, since falling in love with Milk and Honey and The sun and her flowers last year I can't stop reading. 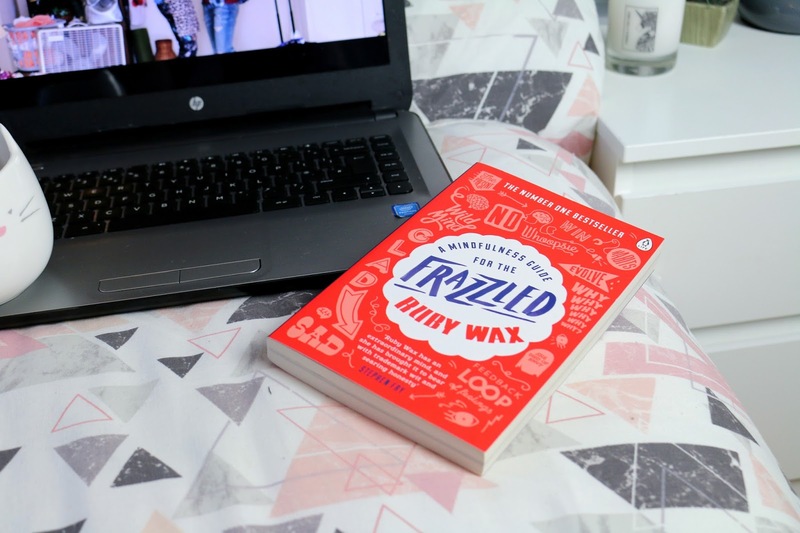 This book Frazzled that Katie got me at Christmas has been a fab read at night. For me pamper nights are so much more than just getting cosy and resting, it's about self care to keep my mind in a good space, to keep me feeling healthy and rested. I really feel that it's important to have some "me" time every now and then, preferably once a week because it can really help you avoid unnecessary stress. Thank you so much for your comment 💕 a good pamper night can never do you wrong! Thank you for your comment 💕 soap and glory are so good aren't they?! I'm MEGGA obsessed with their products at the minute. Thanks for your comment sweetie 💕 it never hurts to have a good pamper night! 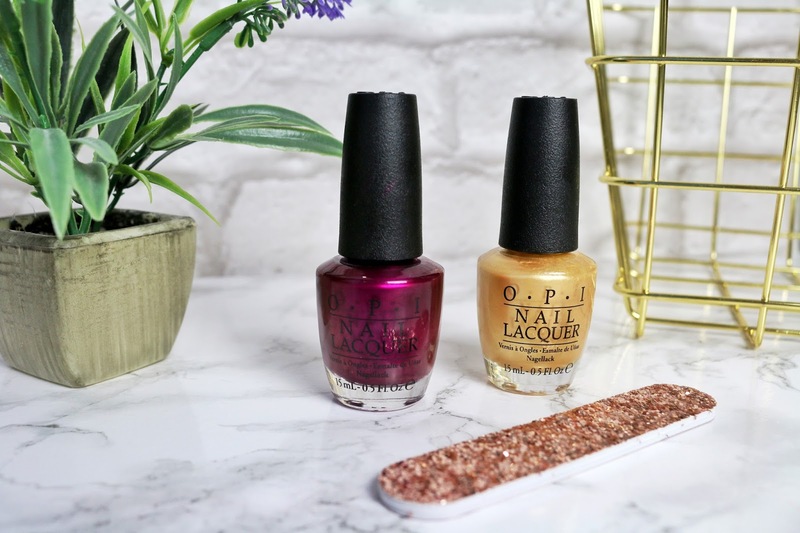 The opi stuff is amazing, such good quality. I felt so relaxed reading this! Just imagining myself getting pampered because of the way you described everything in good detail. Thank you for sharing your routine and motivating me! Aww thank you so much hun 💕 I love ogx stuff, really nourishing and good for your hair! Love the idea of a dedicated pamper night! Beautiful photos and this all sounds lovely. Warming up your PJs on the radiator is such a good idea! Thank's for your comment Holly :) Pamper night's are just the best. A face mask is great, building around it makes it so much more relaxing. Thank you for commenting Emma :) aww that's nice, soap and glory is always a fan present! Hi, you can’t beat a nice pampering on a winters evening, a nice bath pj’s candle and moisturisers. Ive not heard of week heeled foot cream before. I shall give it a try. You really can't! I love the feeling it brings. This sounds amazing. I love pampered nights in the bath especially in winter. Plus I have loads of lush products to use. Thank you for commenting :) Pamper nights are just the best! Thank you so much for commenting :) The soap and glory face wash is AMAZING. Thank you so much for commenting!! It's such a fab thing to do isn't it? A good pamper night. Thank you for your comment :) I always love a good pamper in the winter, always feels like the best time to do it. Thank you so much for commenting! a good pamper is always needed, best feeling. Loved your pamper night. I felt so relaxed reading this. I'm looking forward to a nice bath tonight. This sounds so perfect! You really can’t beat jarmies fresh off the radiator!! Thank you for your comment! And you can't such a fab feeling! Thank you so much for your comment :) Before I started really caring for my feet I hated them and they felt rough but since this new routine, they feel amazing. Thank you so much for your comment :) Same, that would be bliss! This looks like a great pamper session! I’ve been having quite a few myself lately and I feel great for it! I love OGX hair products they are brilliant! Thank you so much for commenting :) It's so good to stay on top of the pamper evenings, so relaxing. That looks like such a great routine! I try to do something similar every once in while especially if I am really stressed out! Those products look really good as well. :) Lovely post. Thank you so much for commenting :) I love this routine, it feels amazing to be on top of it now. Pamper nights are a must! 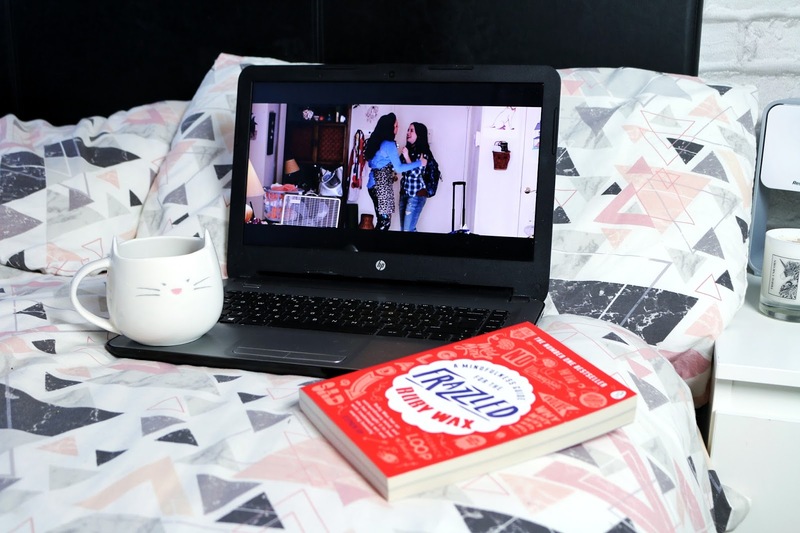 There's nothing better than having a long day and coming home, eating snacks while watching a movie, having a relaxing bubble bath and then getting comfy in your bed with fresh pajamas! 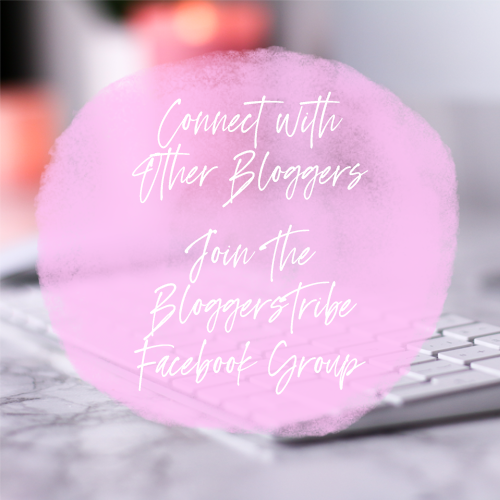 I love this post alot and it reminds me how much I deserve a pamper night at the moment as I'm just soo stressed and I feel this would help me a lot! 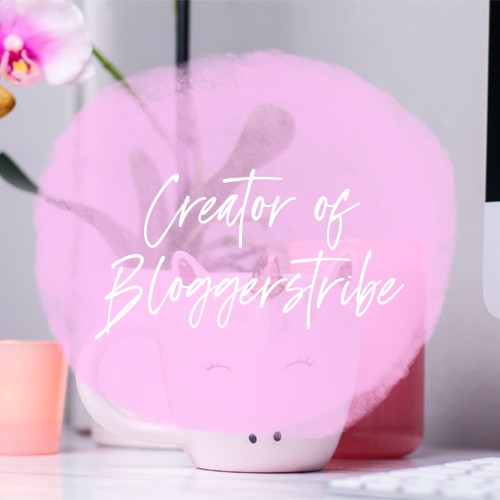 Thank youu lovely for a great post. Wow your pamper nights sound awesome. I really need to pamper myself when the girls have gone to bed more, I just forget. They've tired me out so much I end up just monging out on the couch watching Netflix trying not to fall asleep and fall off the couch. Great pictures! Pampering yourself after a long days work is especially nice in these dark wintry nights so thanks for these lovely ideas.